GCA Altium acted as exclusive financial advisor to the Austrian packaging specialist ALPLA on its acquisition of 100% of Boxmore Packaging, an African market leader specialising in PET pre-forms, PET bottles and closures. ALPLA is one of the leading companies in the field of packaging solutions and is renowned throughout the world for producing plastic packaging of the highest quality. Around 18,300 employees at 172 locations across 45 countries produce high-quality packaging for brands in the food, beverage, cosmetics and cleaning industries. Founded in 1995 and headquartered in Johannesburg, South Africa, Boxmore Packaging is seen as the southern African market leader for PET pre-forms and bottles (ISBM technology) as well as closures. Around 1,000 employees currently manufacture approximately 4 billion of these products each year at nine production locations. All of Boxmore's employees and locations are being taken on by ALPLA and the management structure will remain the same. For the foreseeable future the company will continue to operate under the existing name as a member of the ALPLA Group. 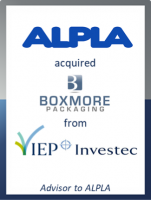 With the locations of Boxmore Packaging, ALPLA now owns 13 production facilities in Africa. The transaction remains subject to the required legal and regulatory approval by the relevant authorities. This deal represents GCA Altium’s 24th Industrials transaction in the last 18 months, reinforcing our position as one of Europe’s pre-eminent advisors in this sector.